Bert and Bill are usually in their office on Kemp Town Goods Station when the 8.20 a.m puffs out of the tunnel. But on Tuesday for reasons neither of them can explain, they were both standing on the platform when the accident happened. The fifty-ton engine, its wheels slipping on the icy rails, ploughed through the buffers and the platform, coming to rest in their office in a shower of bricks, wood and broken glass. Surveying the wreckage Mr Bert Streeter, a 61-year old checker, said: “We’re the luckiest men alive”. Mr Bill Speed, a 59 year old porter, added: “I don’t know why we were not in there; something must have warned us.” The driver of the coal train, Mr John Wood, and his fireman, Mr James Myles, were taken to hospital and treated for shock. 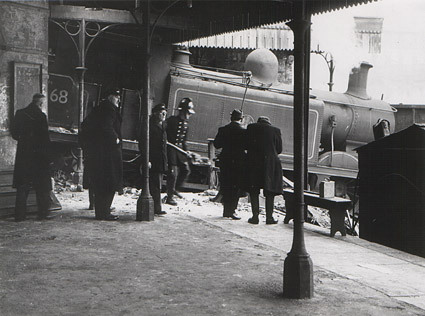 Brighton Fire Brigade put out the giant engine’s fire and helped clear the wreckage. The station has been handling urgently needed consignments of cattle food to help farmers in the arctic weather conditions of the past few days. The fireman who escaped unijured in this accident was later killed in March 1964, when the train he was working on crashed at Itchingfield Junction in March 1964. I used to go and play in Kemptown station and I never ever saw a train in the station, I knew it was occasionally in use but I never realized they were steam trains. Ho Hum.